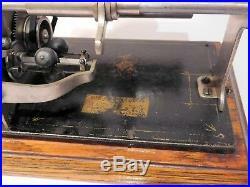 Here’s a great little Columbia’Q’ Graphophone. The simple’Open Works”Q’ is found in two distinct versions. This being the later model circa 1901. 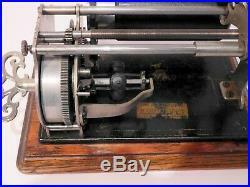 The earlier model has a brushed metal steel bedplate, the winding key is plain and flat and the holding bracket for the governor is attached to the bedplate, circa 1897. This later model Columbia Q has a black painted bedplate with gilt striping and a fancy filigree key and the bracket holding the governor is attached to the spring mechanism body. These great little machines are very compact, measuring 8 5/8″ (220mm) wide by 5 7/8″ (150mm) deep by 6 (152mm) high when the key and reproducer and the horn are removed. Whilst the horn is only 10 (250mm) and takes up very little space. If you wanted to own a piece of history and be able to play some of the World’s earliest ever recorded voices and music then this little machine would suit you. It is so compact as to easily fit in your bookshelf or on your desk top in your home office. This machine has been around for more than 100 years and there’s no reason as to why it shouldn’t be around for another 100 years or more. It has been stipped down and cleaned and oiled. The motor purrs beautifully and is a pleasure just to sit and watch the governor and gears spinning around smoothly whilst listening to the music. There is some surface corrosion and some loss of the gold striping. This one has a wooden base which originally would have had a wooden lid to fit it. It has been fitted with a new reproduction filigree key, a new reproduction horn and a new reproduction “floating” Reproducer with a sapphire stylus made to exacting precision of the originals. The beauty of having the new Reproducer is that the sound reproduced is clear and sharp as it was meant to be when the machine was new and doesn’t sound rattly and screeching as some of the old deteriorated ones do. The spring is good and strong but as is common with these models it may need an extra couple of winds before the record has finished playing as these were produced cheaply in their day to do just the bare minimum that was required of them. There is a speed control on the side that works well. 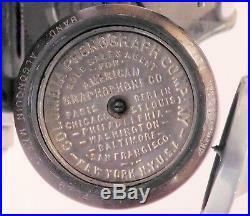 The embossed printing on the end bracket states the patent dates, the last being AUG 20 1901. 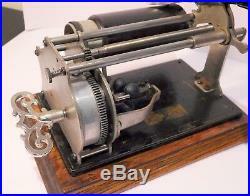 These machines were only ever designed to play 2 minute records as Edison had not at this stage had the concept to produce 4 minute records which required a different Reproducer and different gearing to achieve the desired result. 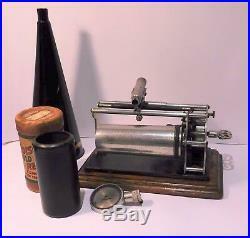 I have included in this sale a 2 minute cylinder record so that as soon as you unpack the player, all you’ll have to do is wind it up and slip on the record and it’s ready for you play and enjoy and be transported back into another era that our Great Grandparents thought of in their time as being the most wonderful invention ever. When family and friends would gather and listen and marvel at the voices and the music drifting through the air from such a compact, little spring mechanism. 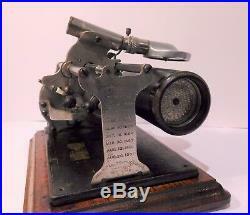 A fantastic little machine to start your collection or just to have as a piece of history. Displays well and will always be a talking point when friends visit and is also a great investment that will only keep going up in value at the same time you’re getting enjoyment from it. 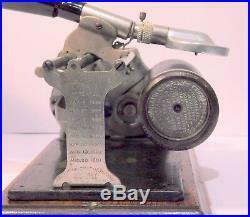 The item “Antique Columbia Q Graphophone Cylinder Record Player” is in sale since Friday, August 10, 2018. 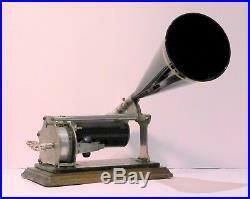 This item is in the category “Collectables\Radio, Gramophone, Phone\Gramophone”. The seller is “barpa22″ and is located in Maroochydore, Queensland. This item can be shipped worldwide.